Bytecoin is a private decentralized and open-source cryptocurrency which allows everyone to contribute to the development of its network and a financial solution for everyone who chooses to maintain financial privacy. Its blockchain offers global, instant and private transactions that require no fees and are completely untraceable. Started in July 2012, Bytecoin shares its history with Monero, another popular privacy coin which came about as a fork of Bytecoin. Bytecoin mission is to develop a new, improved and more efficient financial system that provides better and more advanced services at a lesser cost for its users. Self-regulation. The Bytecoin financial system is a decentralized network that allows self-control for the costs required in the operation of the currency. It enables the system to identify the most optimal state when the operating efficiency is the highest. Openness. Bytecoin runs an open development network, meaning that everyone who joins it uses the currency and supports the system. Egalitarianism. The network protocol is developed to display consistent efficiency on both specialized and non-specialized computers using the network. Three primary market segments can benefit from Bytecoin solutions - customers, businesses, and investors. Regular users can use Bytecoin to store and manage their funds securely, send free and instant international payments, set up high anonymity for the transactions and support the network by mining the currency even on an average computer. The Bytecoin emission rate is decreasing with time, so the BCN coins have a higher probability of sustaining their value. Businesses can take advantage of Bytecoin’s enterprise solutions that promote fair and open business ideals. You can send and receive instant global money transfers without fees, enjoy the network's resistance to hacks and protect the company’s and customers' private data. It’s important to note that the system prevents automatic chargebacks as a part of its fraud protection policy, although now and then it can be a double-edged sword. Bytecoin investors have the opportunity to store their funds safely, privately, and receive annual dividends in USD and BTC. Also, large investors are eligible for unique offers. The Bytecoin network has been built entirely from scratch using CryptoNote, a powerful privacy-oriented open-source application layer protocol. Unlike many projects, it’s not related to Bitcoin in any way except that the team behind it strives to fix all the issues of Bitcoin, focusing on user-privacy, anonymity, and fee-less transactions. Everyone can become a part of the Bytecoin ecosystem by either by mining it or buying BCN on crypto exchanges. Other notable features of the network are transactions, reliability, deflation, and emission. All transactions in the Bytecoin network are fulfilled within 120 seconds. Every BCN transfer is encrypted with secure cryptographic algorithms which prevent anyone from knowing who send and received it, and how much money was sent. The transactions are carried out through its blockchain, allowing users to skip intermediaries like banks, payment gateways, and other conventional systems. The only thing a user needs is an internet connection. Most blockchains keep their transactions in a public ledger, allowing everyone to track transfers between wallets. 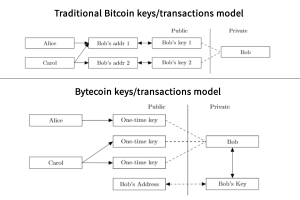 Bytecoin transactions are untraceable, immutable and unlinkable. The network achieves this by using one-time keypairs and one-time ring signatures. The one-time public keys solve the issue of address reuse. It mixes identifiable funds with others to conceal the trail to the original sender and receiver. The one-time ring signatures put your unique signature in a set of other randomly selected user signatures, making it impossible to distinguish your entry apart from other users whose keys are in the ring. Bytecoin users can control their signatures level of secrecy. Naturally, the more anonymous you want a transaction to be, the more resources of the network it will use, leading to higher transaction fees. Like the most fully decentralized blockchains, the security of the network relies on the aggregate computational power of all the computers in the system. The more power, the better the security. In this regard, your funds stored in a Bytecoin wallet are automatically secured by the network. Bytecoin’s consensus algorithm is called Egalitarian Proof-of-Work (PoW). It uses a large amount of memory and makes GPU mining less efficient compared with CPU. Such design was chosen intentionally to level the playing field between powerful GPU and ASIC miners and those who try to mine with less efficient CPUs. The emission of Bytecoins (BCN) is limited to 184 740 million. The current circulating supply is 184,066,828,814 BCN, meaning that more than 99% of coins have been mined already. Everyone is free to participate in the emission of Bytecoins by becoming a miner. Miners confirm that all the transactions are processed correctly and shield the transaction and personal data. Despite that, the miners are still unable to access users’ financial information. The number of Bytecoins released every 120 seconds is decreasing with every new block. Hence, the mining rewards take around four years to halve. Theoretically, the coin should gain more value as its emission is reduced over the years. However, there is a tendency that blockchains which cut their block rewards experience decline in computing power, which in turn makes the network more vulnerable. Bytecoin’s website claims it’s not a significant issue for its blockchain because it trims the emissions at the slow pace. As noted above, Bytecoin is a CPU-mined cryptocurrency using Egalitarian PoW mechanism, making it easy to mine on every modern PC. The block rewards lower every 120 seconds and 99% of BCN coins are already in circulation. Anyone can join the network to mine BCN. The mining difficulty changes according to the network hashrate. It allows the network to keep a stable block rate regardless of fluctuations in the system traffic and the number of miners. The transaction sizes are unlimited, but the larger transactions require higher fees. Every Bytecoin miner can set a soft limit for a preferred size of the blocks. The hard limit equates to a twice the median of the preceding blocks. Each Bytecoin user can vote for the size of the blockchain. There’s an excess size penalty for creating too large blocks. It reduces the block reward for all the large blocks. 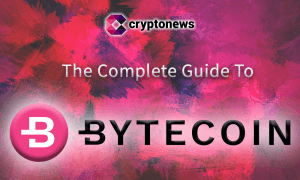 The Bytecoin project has been surrounded by controversy since its humble beginnings in 2012. Such a high centralization means the coin could be prone to manipulation by the developers. Before BCN was listed on Binance, it also had questionably low trading volume, which seems to support the allegations. The Binance listing didn’t go without controversy, too. All the major Bytecoin exchanges had to stop BCN transactions, deposits and withdrawals due to unusually high network load. It led to miniature BCN bubble on Binance while most investors were unable to cash out their BCN holdings. Not so long after, some investors had accused Bytecoin of market manipulation. The year before the infamous Binance listing, the Bytecoin blockchain experienced another issue - the infinite inflation bug. Apparently, all CryptoNote-based cryptocurrencies shared a software glitch which allowed for an unlimited creation of coins in a way undetectable to anyone who has no knowledge of it. The next day 1 million new BCN coins were created exploiting the bug. Last but not least, the Bytecoin team is completely anonymous and shows no interest in revealing their identities. Although it makes sense that the original privacy coin development team keeps their identity secret, it certainly doesn’t help the project. The only official company's spokesperson is Jenny Goldberg. She is also responsible for Bytecoin community management. All the Bytecoin problems raise concern among the currency supporters and investors. Due to these issues, the original privacy coin has lost the leadership position to more trustworthy privacy coins like Monero and Zcash. In spite of controversies surrounding the project, the Bytecoin team continues to work. Recently, they announced many updates, plans, and new partnerships. Bytecoin is already preparing to release v3.4.0 of its software. Besides, it has a fully functioning web, mobile and desktop wallets. Also, Bytecoin Daemons enable ecommerce merchants to accept BCN for their services. The organization's blog is full of regular updates regarding the latest releases, partnerships, and guides - the latest news cover Android wallet release, Gate.io listing, and news about Bytecoin hardfork. 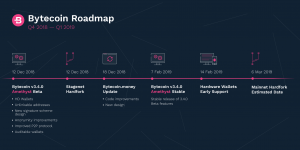 Recently, the team has released a roadmap update for Q4 2018 - Q1 2019. All in all, Bytecoin seems like a decent project with great technology. However, many incidents, allegations, and controversies should raise doubts about the anonymous developers behind the project, their motivations, and intentions. Despite the delistings, plentiful exchanges are still dealing Bytecoin. HitBTC (paired with BTC, USDT, EOS). Poloniex (paired with BTC, XMR). Vebitcoin (paired with BTC, TRY). STEX (paired with BTC, ETH). Bytecoin Web Wallet (paired with BTC, ETH). Cryptonator (paired with EUR, USD, RUR, UAH). Stocks.exchange (paired with BTC, ETH). Changelly (instant exchange service accepting card and cryptocurrencies). Bytecoins can be easily stored on one of its native wallets. You can download them for the project’s official website. On top of that, you can store BCN in the following multi wallets - Freewallet, Cryptonator, Bitladon, and SatoWallet. Monero (XMR) - privacy-oriented coin built to protect users anonymity. A fork of Bytecoin. Zcash (ZEC) - a privacy project built on the Bitcoin code. Dash (DASH) - a fork of Litecoin built for instant private transactions.